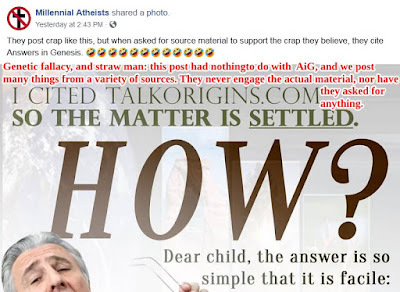 At The Question Evolution Project on Fazebook and in other places, we see atheists and other anti-creationists complain that we do not share material from unbiased sources. Then they trot out links to sites that promote evolution and atheism. 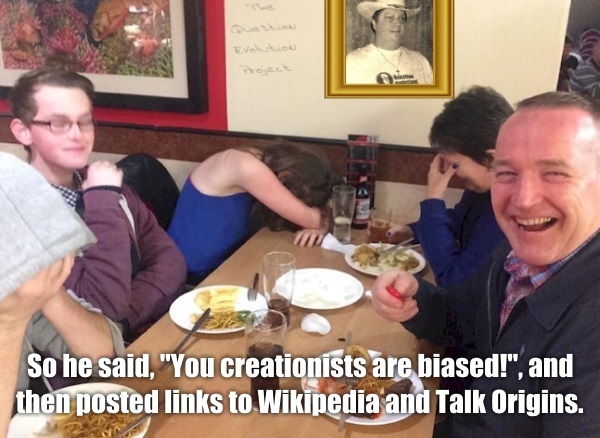 Apparently, they consider "unbiased" to mean "not creationist". People who have read this site have probably seen my remarks that people who want to convince others of their viewpoint are biased. Not only are biblical creationists biased, but we are also quite open that we want to convince people that muck-to-misotheist evolution is false and that the evidence supports special creation and the worldwide Genesis Flood. Evolutionists are biased just like anyone else. Someone posted my article on the Roku streaming device in a Fazebook group. I mentioned that Roku carries the NRA channel, and someone hysterically typed that nobody should read the article because it was "right wing". Not hardly! She had a leftist bias. Also politically related, the US media are notoriously leftist and hate President Trump. Their reporting is skewed to the far left, even using frequent dishonest statements. Positive news about Trump is mostly obtained from non-mainstream sources. Respected left-leaning journalist Ted Koppel showed some of his bias, but clearly stated that the media are against Trump. Of course, the biased media tended to ignore his comments. I had a manager who claimed that the day shift was slacking, but the night shift did all the hard work. His bias interfered with his judgment, and he didn't understand the process: day shift got the ponies saddled and night shift put them into the corral. That is, the system needs several processes that begin early and are completed later. Ever hear of the Dinosaur Bone Wars? A couple of jaspers back in the late 19th century were competing with each other to find more, bigger, better, impressive dinosaur bones. They spent a lot of money, and I reckon it was more about egos than science. More importantly, their presuppositions and biases contributed to their mistakes. To learn about this, you can see the video and also read the introduction at "The Great Dinosaur Wars". Biblical creationists are biased because we presuppose the Bible is true. The evidence supports this, including recent creation and the Genesis Flood. I'll allow that my bias shows in that I detest the twisting of Scripture to support old earthism, theistic evolution, and hybrids that compromise secular views with the Bible. Some tinhorns insist on calling us "liars" because of their antipathy for the creation message, although they cannot document their claims. (Some simply continue to repeat them, which is the fallacy of repeated assertion.) If you study on it, you can see that calling us liars is ridiculous. We believe that God is holy, righteous, and just. He hates lying. So we're going to lie to get you to believe in him? Another aspect to the charge of bias is that it is a genetic fallacy. That is, the material is rejected because it came from creationist sources. Watch for the subtle combination of ad hominem and genetic fallacy where people distinguish between "real scientists" and "creation scientists", implying the lie that creationists are not "real" scientists. 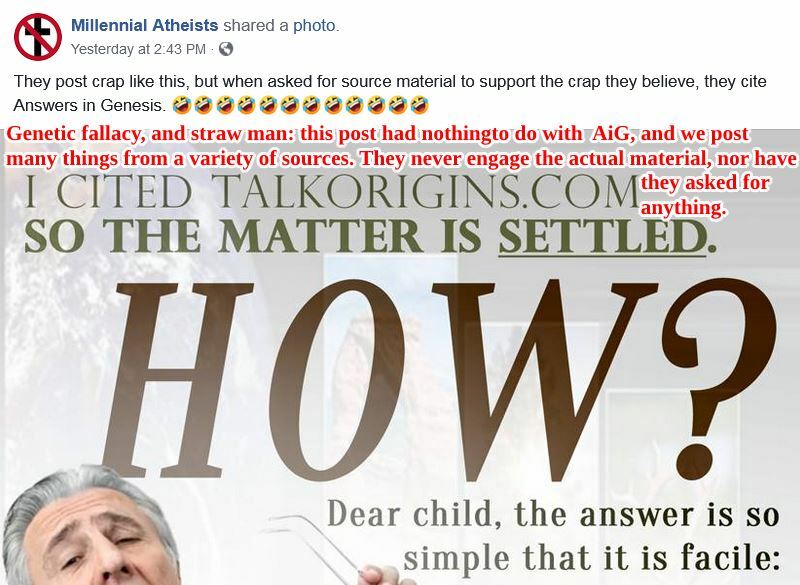 Using the genetic fallacy again, anti-creationists have mocked the RATE project, a creation science initiative on the age of the earth and radiometric dating. Mockery and ridicule are not refutation, nor do they advance an intellectual argument. Their bias prevents them from having intellectual honesty. In my unfortunate dealings with theistic evolutionists and others who insist on elevating constantly changing man-made science philosophies above the unchanging Word of God, they not only propagate bad science as long as its in their best interests, they also torture Scripture until it confesses to whatever they want to hear. Dealing with TEs is like being invited to a necktie party. Although I have returned to Christianity, my days of making some - occasional - inconvenient sacrifices for God are probably over. Because all I ever found was an entity that allowed me to make (sincere) mistakes that did not help me, caused me to feel wrongly guilty about some things, and let me think it was a good idea (was there any ready alternative) to listen too much to headstrong church leaders in order to gain 'acceptance' at church. Also an entity that never much helped me to my knowledge, which pretends not even to exist, and which assuming he does also presides over huge injustice in this world whilst calling himself a God of 'justice' (who demands eg that all people - who are not all equally strong - keep to the same general standards of behaviour (of avoiding 'sin') as practising Christians (and who apparently sends murderers, and well-behaved but unsociable or misanthropic people, both to the same 'hell' if they fail to believe in Christ)). And the Bible is patently not (as claimed by people like R T Kendall) 'infallible', and young earth creationism is not truth/the truth/scientific truth even if it is 'sound doctrine'). So - now, better late than never, a better informed and in consequence of that a questioning Christian (a term used once by David Cameron I think). Not - if ever was - a 'fanatic'. I am not going to pretend certainty about things I am not certain of to gain God's acceptance, I am not going to say stuff to non-Christians that I am not certain is true simply because I'm supposed to be terrified of God. I would never - as was the case in the past (from 1979 to 2007) - deny being 'Christian' if asked. But - I now know why I was so reluctant to bring up the subject outside of church. I do not feel very much 'love' for a God who gains converts out of fear and guilt as much as love for sinners. I made a recommitment on 5 January - but nobody else is going to get to define my commitment for me more than myself. He claimed to be "more Christian" than I am in a forum, but these are not the words of someone who has submitted to God in repentance. He says I am evil and has even called God a liar on more than one occasion, and he expends tremendous amounts of energy attacking biblical creationists in general. I lack belief that he is a Christian, and he needs to humble himself and repent. ...that's a useful piece of text from the Cowboy. It's classic! I've just got to keep it for the record! That sort of spiritually intimidating character deformation and slander of Christians who don't follow the fundamentalist line is to be found in every sectarian cult between here and the Watchtower's Brooklyn HQ.! Keep up the good work!" That is a combination of straw man and ad hominem from a professing Christian who acts just like an atheist and is cheering on an enemy of God. Similarly, I was told by a theistic evolutionist that I need to "follow Jesus" because he disliked an article I wrote. When I challenged him to show what in that article or my statement of faith would indicate I am not a follower of Jesus, I was ignored. His bias prompts him to bushwhack creationists. Theistic evolutionists are often difficult to distinguish from atheists, and they are frequently found in bed together, hating the God of the Bible. I have concluded that they are idolaters, having made a god that they are comfortable acknowledging. They need to humble themselves and repent. You can easily see bias from their false religion of evolutionism and pretense at religiosity. James 2:19 NLT. Many anti-creationists, atheistic or otherwise, think that ridicule is refutation, as if it makes atheism less foolish or Darwinism less false. Folks who think like that are clearly biased against biblical creation science as well as the Bible. But as I said before, creationists are biased and we are open about it. To read the rest of this short article, click on "Are Creationists Biased?"